"And so you have found time to do all the tasks?" answered her godmother," You have learned one lesson, Irene. When you have learned a few more lessons, I shall send you home. For I need my cottage so that I may teach other little girls not to be lazy. Now hold up your hand." Irene did as she was told, and her godmother placed a strange-looking ring upon her finger." Every time you are lazy, this ring will prick you," said the fairy." When you have not been pricked once for a whole week, I shall know that you are no longer a lazy girl." You must not think that Irene found it easy to learn her lesson. Many times the wonderful ring pricked her finger, but she had made up her mind to try very hard not to be lazy. One day Irene sat at her window, thinking. It was her birthday, and, for the first time, a week had gone by in which the ring had not pricked her once. 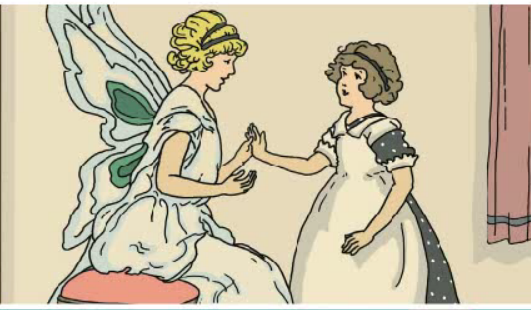 Suddenly the fairy stood before Irene. "Oh, godmother," cried the happy little girl," have you come to give me a birthday party?" "Yes, That is the very reason I have come, Irene," replied the fairy," You have learned your lesson well, and you may go home after your party. Now tell me, are you not much happier than you used to be when you were so lazy?" "Oh, yes, dear godmother!" answered Irene," And thank you for teaching me how much more fun it is to be busy. Here is your ring, which you may now lend to some other little girl who is lazy."